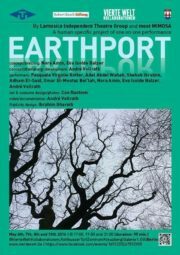 In December 2016, Christel Weiler shared her impressions about a performance called Earthport in her essay "The Art of Encounter" here on Textures. Now, the project's director and former IRC-Fellow Nora Amin talks about the same performance, describing the process of rehearsing and performing from her point of view, and sharing her observations and thoughts with us. Last year’s 12th edition of the annual Tangier International Conference entitled “The Narrative Turn in Contemporary Theater” aimed at recapturing narrative elements and contemporary practices in different theater and performance cultures in order to interrogate the return to narrative-centred traditions. As an integral part of the conference the festival Performing Tangier presented not only Moroccan productions but a variety of performances from the Arab world. 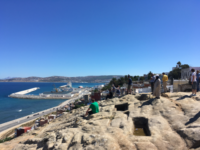 IRC-Research Associate Stefan Donath visited Tangier and shares his impressions with us. To welcome the new Fellows to the International Research Centre “Interweaving Performance Cultures”, Erika Fischer-Lichte and Christel Weiler convened a meeting at the beginning of the academic year 2010/11 to discuss the Centre’s programme and concepts. The following conversation between Erika Fischer-Lichte and Rustom Bharucha about “interweaving” versus “intercultural” took place on this occasion. The Kulturstiftung des Bundes funds collaborations between city theatres in Germany and theatres from abroad. The Mainfranken Theater in Würzburg has started a collaboration with the Burkinan C.I.T.O. Theatre. Kai Tuchmann, currently executive dramaturge of the Mainfranken Theater, reflects on this international collaboration. Upon leaving the International Research Center "Interweaving Performance Cultures," Brian Singleton gave an interview in which he complicates terms like orientalism, interculturalism and interweaving. In Ariane Mnouchkine's performance Les Naufragés du Fol Espoir he perceives what he calls "an ethically conscious intercultural" he generally believes to not have happened yet.